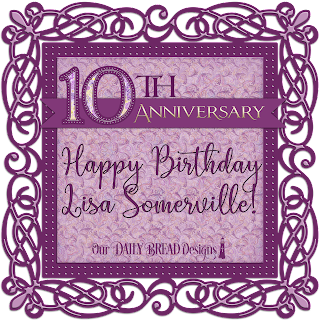 Divinity Designs, LLC Blog: Happy Birthday to Lisa Somerville!! 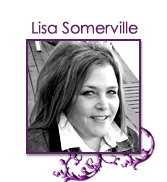 Happy Birthday to Lisa Somerville!! 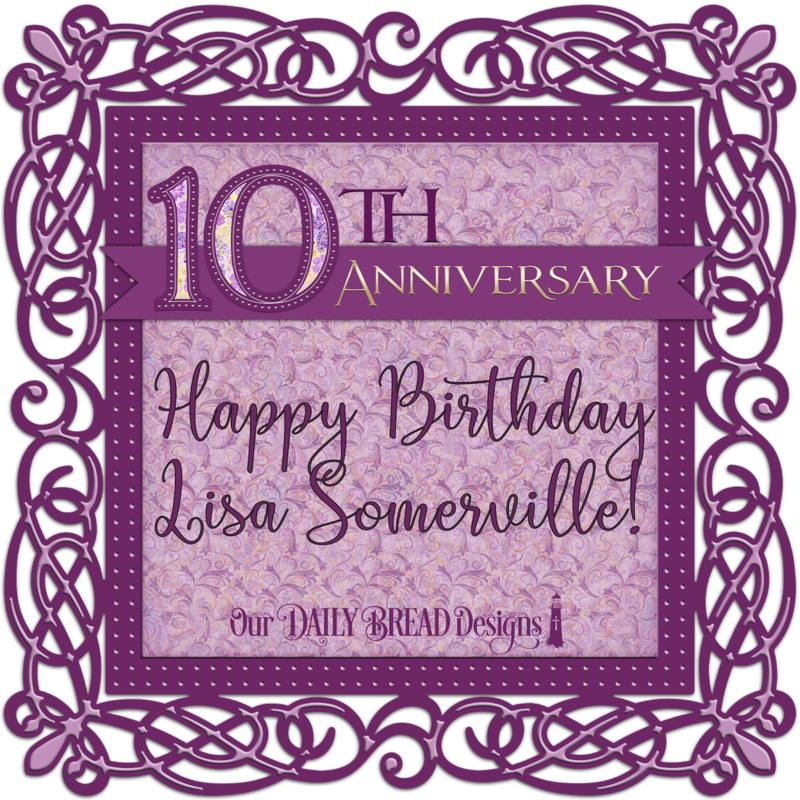 I know we are in the midst of our 10th Anniversary Celebration Week, but I just had to sneak this post in and share this day with Lisa Somerville. In case you do not know Lisa, let me tell you about her! 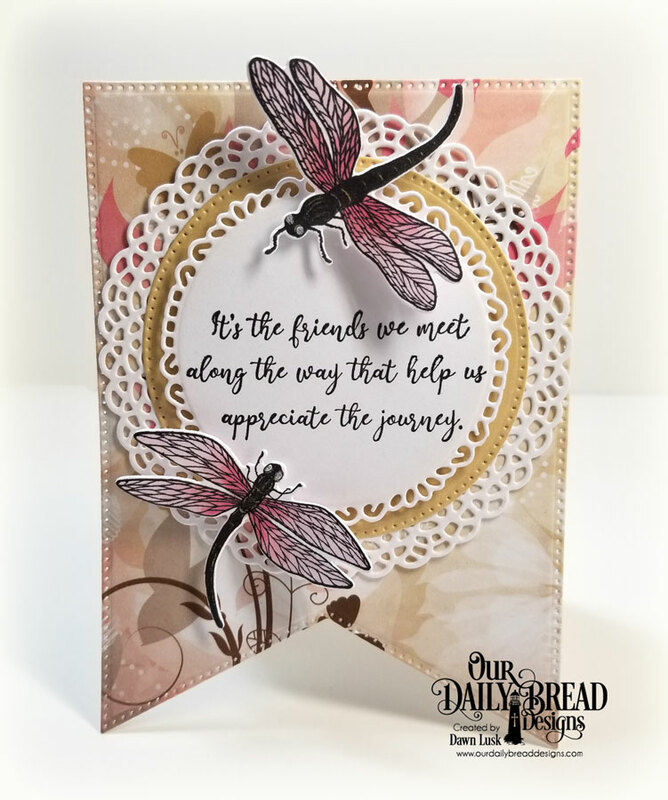 Lisa started working with ODBD back in the fall of 2008 when she started designing cards for us while she was working for a publication we used to advertise in. 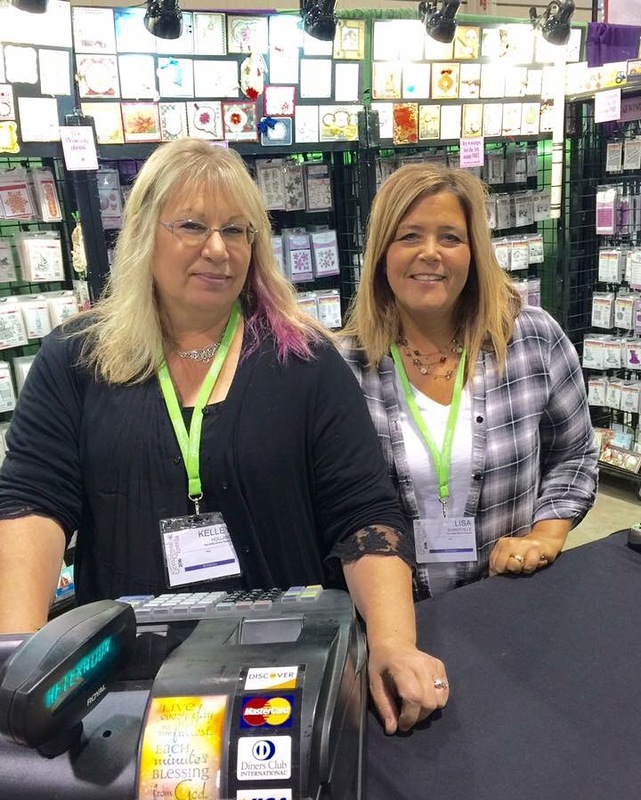 Soon after, Lisa started working at some of our stamp shows and then joined the Scrapbook Team (we used to have one way back when). hand man, my assistant, my person who does everything...LOL!!! When I think of some words that best describe Lisa here are just a few that come to mind: loyal, supportive, tireless, hard-worker, honest, trustworthy, and awesome promoter for ODBD! Although I live in Ohio and Lisa lives in Illinois we work together very closely, and we text and Skype all day and evening, weekends included! etc, etc, etc.....the list goes on! One of the things that Lisa likes to do is send me verses and quotes. In fact, she sent me a bunch of quotes about FRIENDSHIP and when she did an idea popped into my head. What better way to honor Lisa on her birthday then to design a stamp set based on Lisa's suggestions! 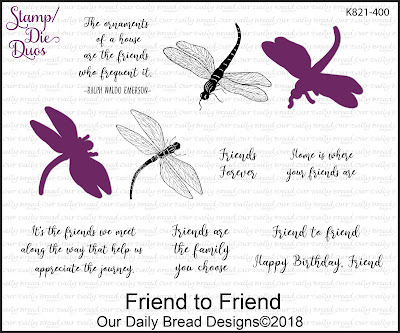 We have a new stamp set called Friend to Friend to share with you today! How awesome is that? 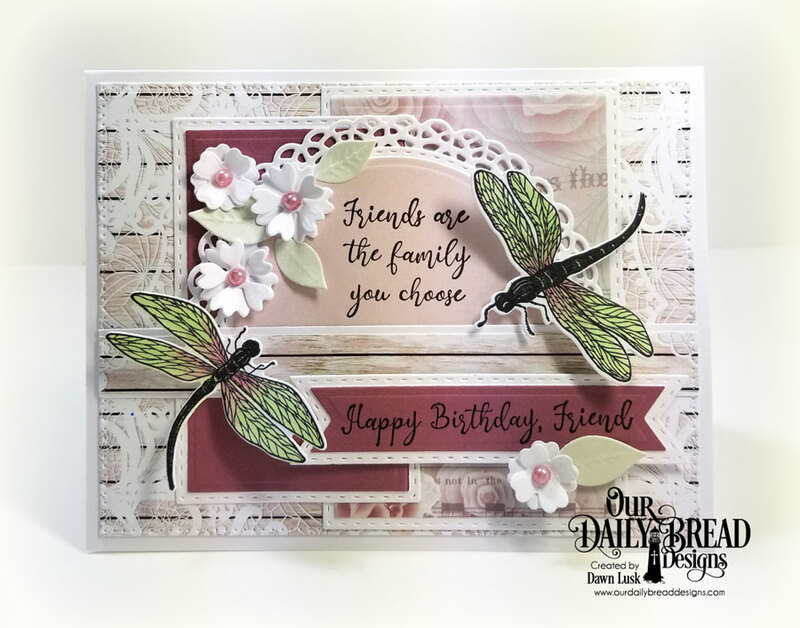 The ODBD Design Team, who quickly agreed they wanted to be a part of this special day, all designed cards to wish Lisa a very Happy Birthday!! Aren't these birthday cards for Lisa just BEAUTIFUL? Thank you SO MUCH to the ODBD team for taking the time to help honor Lisa today!! If you love this stamp set, Friend to Friend, as much as I do, then I know you will want to purchase it to make cards for your friends!! Due to a slight delay, this set is available now as a Pre-Order and will be shipped out at the end of next week sometime! By the way, it is also Lisa's moms birthday today! Happy Birthday to Gerry Johnnic! I am not finished yet! 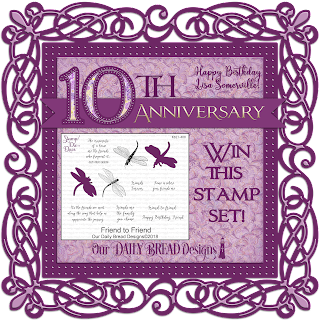 You can also WIN this stamp set just by wishing Lisa a HAPPY BIRTHDAY in the comment area. 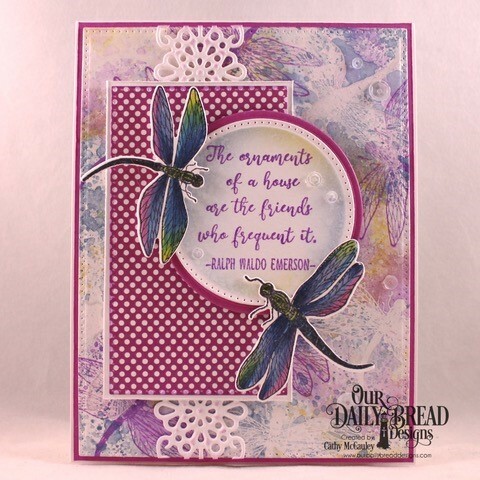 I will choose 5 lucky winners to receive this new Friend to Friend Stamp/Die Duo set! Commenting ends March 18, 2018! Thank you for visiting today! We also have another post scheduled for today featuring the ODBD Design Team's Top 10 cards of the last 10 years!! I hope you enjoy seeing our designers top picks!! Stay tuned for more 10th Anniversary Celebration this week where we announce our 2018 Special Edition Anniversary stamp sets and dies!! Happy Birthday, Lisa! How fun to celebrate with a new stamp/die set! Hope you have an amazing birthday, Lis! You are a ROCK STAR in my book! Thank you for everything you do for our team and for ODBD!!! Love, hugs, and a big Mwaaaah!!!!! Happy birthday Lisa! How wonderful to be recognized with your own stamp set! Enjoy your day, appreciate your friends. Happy Birthday Lisa! I hope you have a wonderful day. Happy Birthday, Lisa! What an honor to have a special stamp set dedicated to you. And I love the set. Contratulations. Have a wonderful birthday. Happy Birthday, Lisa!!!! Love the verses/quotes, love the set! Have a wonderful day! happy birthday Lisa, I hope you have an awesome day! Absolutely love the cards! Happy Birthday, Lisa. I love all of your birthday cards and thanks for the friends quotes. How wonderful that your employer recognizes all your hard work! Lovely stamp set with very special meaning. Happy birthday Lisa!! You have inspired a beautiful stamp set. Have a wonderful day!! HAPPY BIRTHDAY, Lisa! What a BEAUTIFUL TREASURE to be honored with a stamp set! I know you know this, but you are VERY BLESSED to have found a group of ladies & one in particular friend, Kelly there at ODB! Life doesn't always deal us "good" friends. Sometimes, it's like finding the needle in the hay stack! LOL You are TRULY BLESSED!!! Being a "good" friend yourself has paid off! MANY BLESSINGS on your birthday! 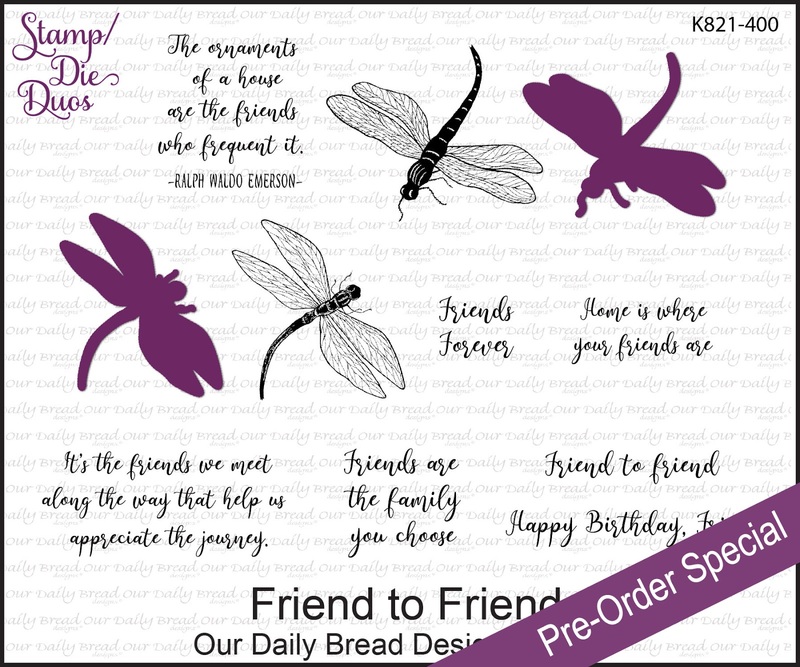 I KNOW you will have a WONDERFUL DAY after the surprise & release of this stamp set for you today!!! TRY to peel yourself off the ceiling & have some cake too!!!! ;) HAPPY BIRTHDAY!!!!! I am so proud to read this great post about my amazing daughter! Thank you to the entire ODBDT for all your hard work, praise and for honoring her! The cards are beautiful!! The stamp set is amazing! I am so happy and proud! Mom loves you Sissie!! Happy Birthday honey. Happy birthday Lisa! Enjoy your day! Happy birthday to Lisa and thanks for all you do to help make ODBD run smoothly. 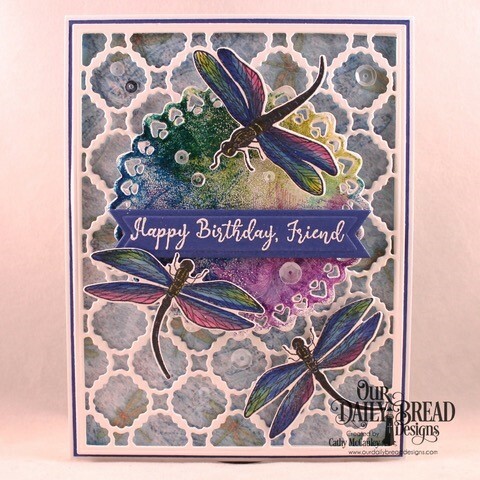 Love this sweet dragonfly friendship set. Happy Birthday Lisa! Thank you for all your contributions to ODBD over the years! Happy Birthday, Lisa. I hope your day is full of wonderful surprises. Happy Birthday Lisa! I hope this is the best day ever for you! Happy Birthday, Lisa! What an exciting way to spend your special day! The new friendship set is adorable, and DT, you have done an amazing job of showcasing it! How nice, Lisa, to work for such an incredible company, and for people who totally appreciate all you do for them! Have a day filled with blessings! Beautiful cards from all the ladies too! Happy birthday Lisa!! Such a beautiful way to wish a dear friend!! Beautiful cards from the team. A very Happy Birthday to Lisa!! 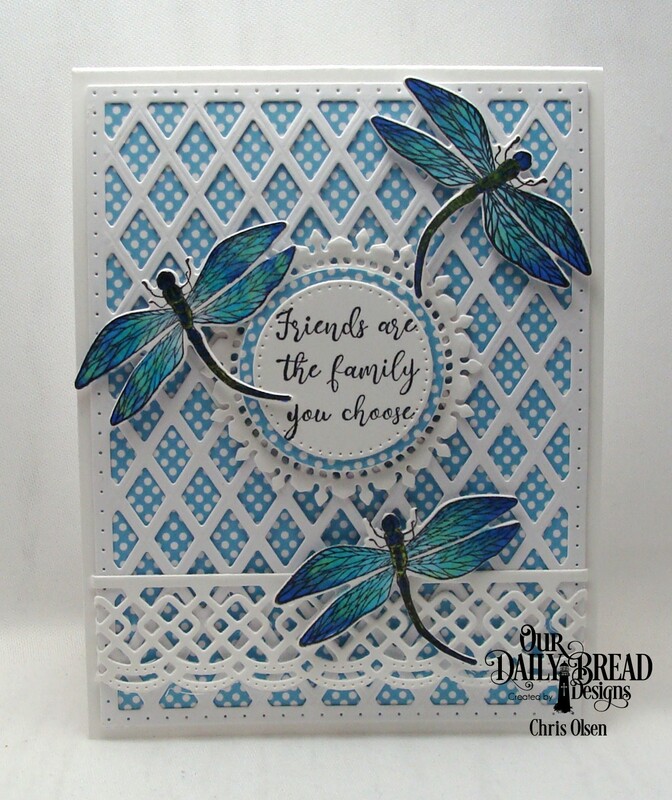 This dragonfly set is beautiful!! Happy Birthday Lisa! What an Awesome Stamp set! Hope I win it!! What a beautiful stamp set! I love dragonflies so I need this set! Happy birthday to an incredible Lisa! You are amazing and so is your beautiful work!!!! Happy Birthday, Lisa! (and Gerrie!) . What a nice tribute; I loved this post and the cards are just BEAUTIFUL!!!! 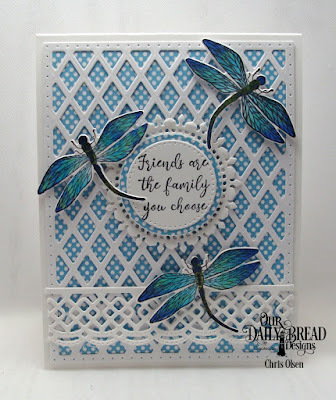 What beautiful cards for Lisa - and a gorgeous set; the curve in the dragonflies is something a little bit different and special. I really like the back story to sets like this, and Randi's Song, and the two sets for Grace. It adds richness, associating a person with the stamps. Happy birthday Lisa and Gerrie! Dragonflies are special to our family - my daughter told me when she was 3 that she wasn't afraid of them because they were visitors from God. What a blessing to have your own stamp set in your honor! Awesome work, Lisa! Happy birthday! Wishing you an amazingly creative year! Wishing you a Blessed Birthday celebration Lisa. 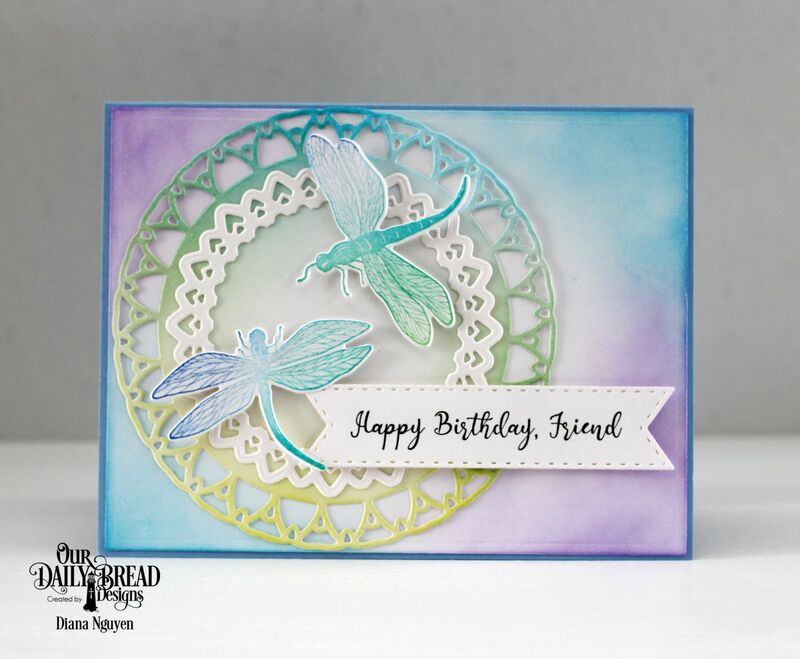 May God continue to inspire you to create beautiful cards! Happy Birthday Lisa! Enjoy your special day. Have a wonderful birthday Lisa! A beautiful stamp and die set celebration is a pleasant way to help you celebrate! Happy Birthday, Lisa! 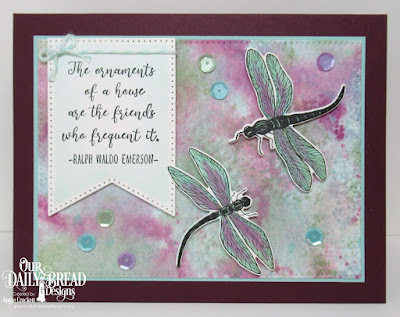 The stamp set you inspired is beautiful! Hi Lisa, Wishing you a very special happy birthday. How could you not have a nice day, with all the beautiful cards! Happy Birthday to you..
Beautiful cards ( as usual). I just love the stamps. HAPPY BIRTHDAY Lisa! Happy Birthday. You are much appreciated! God bless you in all you do. HAPPY BIRTHDAY LISA!!! What a beautiful gift to have a stamp set designed just for you. 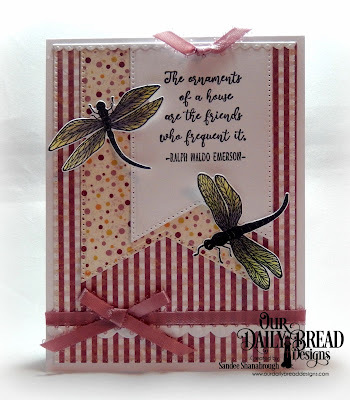 It is so pretty with the dragonfly's and the sweet "Friend" sayings. What Special Friends you have at ODBD. You are truly Blessed. All the Design Team cards are so delightfully beautiful. Great Job Ladies. Happy Birthday Lisa. Love your creations! Enjoy your celebration. Happy Birthday, Lisa! All of your work is appreciated. May the Lord bless you! Happy Birthday, Lisa! Have a fabulous day! Happy Birthday Lisa. May God bless you! Happy Birthday Lisa. What an honor. A stamp set just made for you. The set is so true about Friends. May you enjoy many more great birthdays. Happy Birthday Lisa! Wishing you the most spectacular day, but it seems others have already done so. I'm grateful to be able to call you a friend so this set is perfect for you. Happy Birthday! Thank you so much for all of your good work! Happy Birthday Lisa. May the Lord make Himself know to you in a special new way this year. Happy Birthday, Lisa! You are a stamping rockstar! I have followed you for years and always admire the class you bring to all you create. �� Happiest birthday wishes, Lisa. Blessing to you today as you celebrate another year. May each continuing year is your life be better than the last. Happiest of birthdays to you, Lisa!! I can see why Kelly calls you her right-hand man. You fulfill significant responsibilities for ODBD! The stamp set is gorgeous with beautiful dragonflies. Each of the designer card are beautiful. Great work team on wishing Lisa a fantastic birthday! Hugs, Lisa! 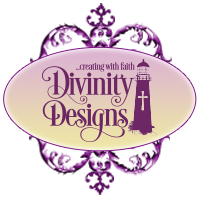 Continue to make ODBD one of the best site for scriptural stamps! Happy Birthday, Lisa! Kelly is very Blessed to have you as her right-handed-man and especially as a friend.May you have a wonderful year. Love the stamp set and the fact that it was made to honor you. Happy Birthday Lisa! I love your card designs. Have a wonderful day and may the coming year be the best ever! Happy, Happy Birthday, Lisa! May God bless you through another year! I love your cards and inspiration. Your tutorials are most helpful. Thank you! A Very Happy Happy Birthday Lisa! What a blessing you are to ODB - which has ministered to me and my friends so much over the years! Happy Birthday Lisa. How special to have a new stamp in your honor. I love the sayings. I will share them by doing cards for my friends! What a special tribute to Lisa and everyone should be lucky enough to have a Lisa in their life. Happy Birthday Lisa! Hope your day is super special~! Wishing you a Very Happy Birthday, Lisa :) How wonderful to have a stamp set in your honor; the sentiments are so nice and the DT cards are beautiful as always. Happy Birthday Lisa and may God richly bless you for all your dedication to ODBD. Happy Happy Birthday Lisa. Love your in honor stamp set. Happy Birthday, Lisa! And, a Happy Birthday wish to your mother as well. Happy Birthday Lisa! I hope you have an awesome day and how awesome to have a stamp set designed for your big day! o, and please tell you mom happy birthday for me! Happy Happy Birthday, Lisa!! Hope your day is magically wonderful!! Hugz! Love dragonflies and the new stamp set!! Was great working with you again! And Happy Birthday to your mom as well!! Happy Birthday Lisa! Love the stamps! Happy Birthday Lisa ! Just want to know that I appreciate what you do too. I met you once at a show, and you were so very helpful. Such dedication and energy are valued qualities in my world. So THANK YOU again for all you do. 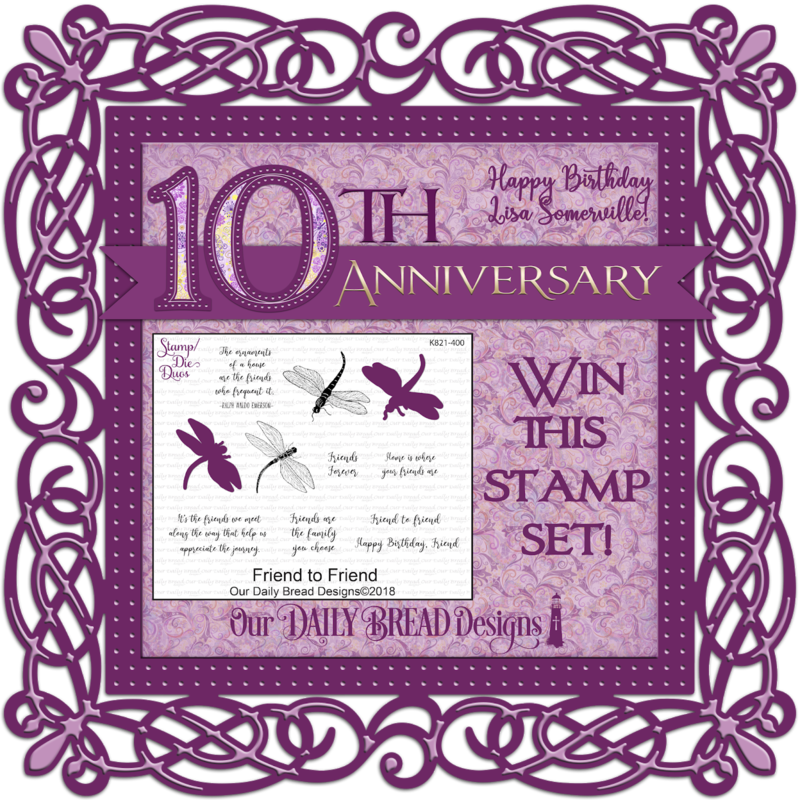 Wonderful stamp set, and sample cards done in your Honor. Happy Birthday Lisa!!! My husband was born on Pi day and he is still eating his birthday dessert. I have been looking and looking for dragonfly stamps and this set is perfect! I love all the examples. Just so great! happy birthday, lisa. what a glowing recommendation from your "boss" / friend. you must have many special friends. Happy birthday Lisa! Love the beautiful friend quotes. Happy Birthday blessings, Lisa! Here's to another year of wonderment and God's blessings !! HAPPY BIRTHDAY LISA.........You are a multi talented lady and apparently a well loved employee and friend to many. Wishing you the best of everything on your special day and always. happiest of birthdays and thank you for all you do. This is one of my favorite places to go for inspiration. Happy Personal Holiday, Lisa! Looking forward to seeing you and the ODBD team in Novi, MI in May. Have a swell rest of your day, kiddo! Happy Birthday, Lisa! How fitting that Kelley chose to honor you with your own stamp set. The DT did a great job showcasing it as well. May the Lord continue to bless you and may the upcoming year be your best yet. Happy Birthday!! Happy Birthday, Lisa. Hope you have an extra special day! Happy Birthday Lisa! Hope it's a spectacular day! Happy Birthday Lisa! It's so awesome to have your very own stamp/die set. How great that Kelley used your own quotes. It seems like you all have such special friendships and that is what matters most. May God continue to bless your friendships and all the new ones you make along the way. Happy Birthday, Lisa! May you be blessed with many more. Happy Birthday ... and here is to many more! Happy Birthday Lisa!!! 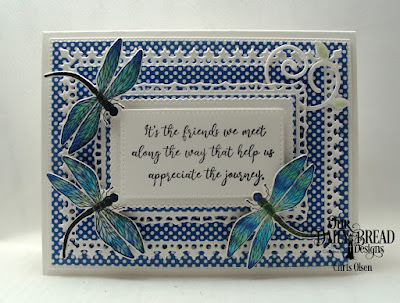 I love your dragon fly stamps and the cards you made with it. My birthday was on the 13th. Birthday blessings to you Lisa. 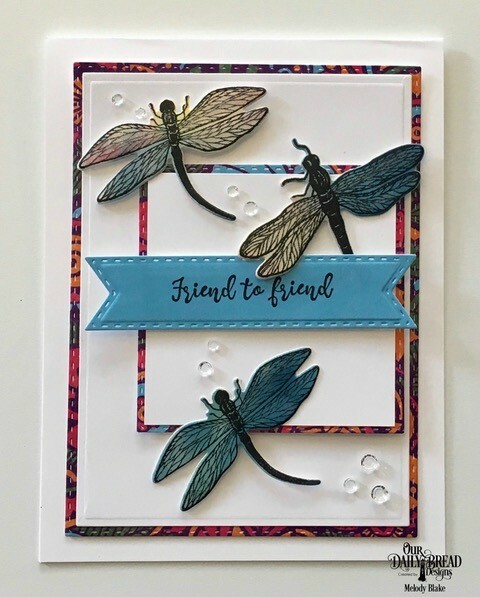 The dragon fly stamps are so special and the cards created,with it are truly special as is one of my favorite sentiment ,friends are family you choose. Your family truly honored you in a wonderful way. Happy Happy birthday Lisa!!! Wow you definitely sound like a lady who is very valuable to her employer. Such a nice tribute in your honor!!! Have a most blessed day. Happy Birthday, Lisa! You are a very fortunate woman to have such great friends and a great company for which to work! Love the stamp set. Happy Birthday to YOU!!! I hope your day is full of everything that makes your heart smile. Enjoy your day. Happy Birthday Lisa! How blessed you are to work at ODBD & have so many wonderful friends! Blessing to you! Happy Birthday, Lisa! May you be blessed with a wonderful day and many years to come. Thanks for your inspiration. Happy Birthday Lisa! Happy Birthday to your mom too Gerrie. I hope you both have a very special birthday. My mom, sister and I had birthdays four days apart in November and I remember how much fun we had celebrating together. Thank you for all you do. Happy birthday, Lisa!! Also happy birthday greetings to your mother, Gerrie, also! May God shower you with much grace and many blessings on your special day and always. Happy Birthday, Lisa!! You definitely inspired a wonderful new stamp set. I hope you have a day filled with surprises and joy!! Happy Birthday Lisa! What a special relationship! Blessings! 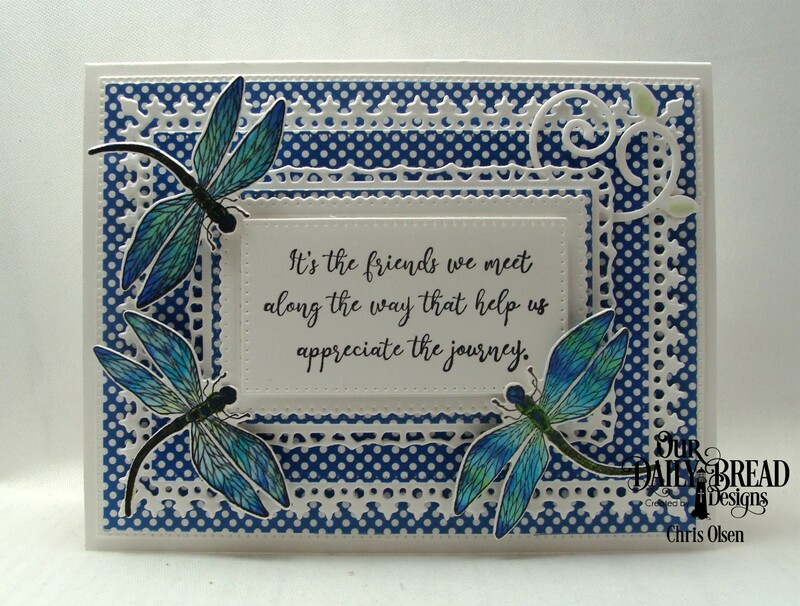 I treasure all the friends that have come to me through papercrafting. Happy Birthday Lisa. 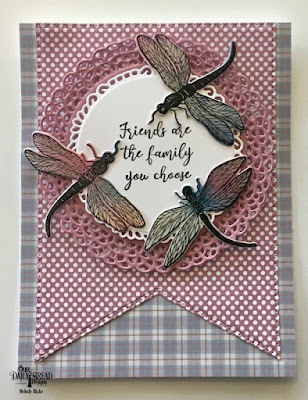 You received some beautiful cards from friends who love you. Birthday blessings to you Lisa! Keep up the beautiful work. Birthday blessings to you Lisa! Happy, happy birthday to Lisa & her mom! The friendship set is going straight to my wishlist--absolutely love it! This stamp set that was deigned with you in mind, is so pretty. I love dragonflies...and this set captures their fleeting grace. Happy Birthday to you, LISA and many more................! Happy Belated Birthday Lisa! What a beautiful post! Lisa is the best! So happy to see this lovely post celebrating Lisa! Happy birthday Lisa. Keep up the great products. Happy B-Day Lisa!! Love this set and the cards are beautiful. Happy 10th B-Day also to the company...love you guys!